The day before CES kicked off for us, our buddy kovdev pushed a few icon packs to Google Play. Now that we are back home, on a much better Internet connection, we can take a look at what Dave has been working on. The new packs are called Illus, Dekk, Omne, and Merus. Each pack looks rather clean and minimal, with a couple of them featuring flat appearances, and Illus showing off the long shadow technique which kovdev has mastered in the past couple of months. To sum up their looks best, Illus is a square pack with long shadows, while Dekk and Omne feature rounded corners and flat art. 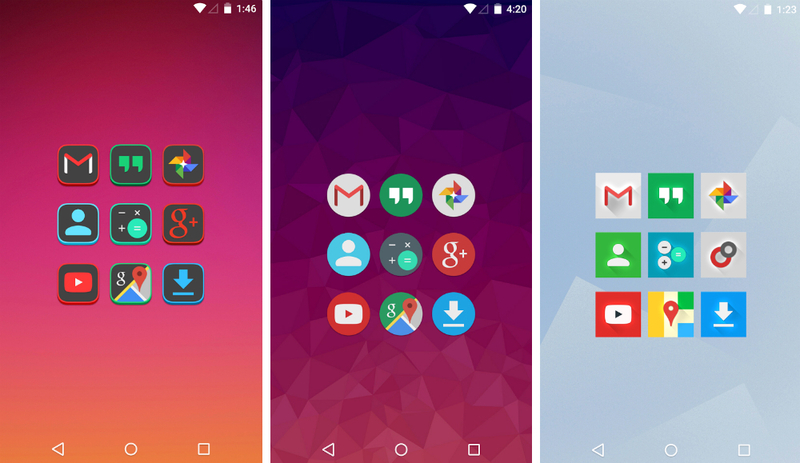 Merus is a circle icon pack, but is flat and colorful. Each pack features its own set of wallpapers, but thanks to the implementation of the Cloud, buyers have access to all of kovdev’s wallpapers. Access to the papers make each of these $1 apps completely worth the purchase. If you rock a 3rd-party launcher, like Nova, head on over to Google Play and check these out. In related news, if you follow Dave on Twitter, then you may have seen that he has started a new job at Cyanogen Inc. Wish him luck!